Are your cuttings not taking shape? Do they experience rapid ageing? 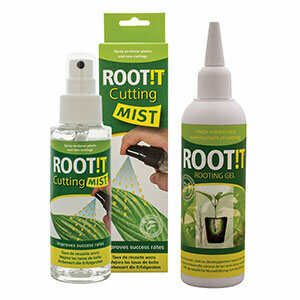 ROOT!T Cutting Mist and Rooting Gel are the perfect combination to make sure your cuttings are effective. Taking a plant cutting is stressful for both the donor plant and the cutting. The shock to the cutting is extreme and certain physiological responses will be equally extreme. The plant cutting beginning to rapidly age is one of the first processes. Experts believe ageing is a consequence of the presence of abscisic acid (ABA) and ethylene both produced by stressing the plant. ABA and ethylene production in plants is evidence of sugar and oxygen deficiencies which is a consequence of stress disruption to the translocation processes. ABA is a vital plant hormone and is produced by the plant as a response to changes in the environment for example; in cold weather ABA begins the change that protects leaves from the cold. Ethylene has long been known to advance the maturity of a plant under stress to take it to a point where it may be mature enough to be viable away from the mother plant. Examples of this are seen in ripening fruit and cut flowers. Using ROOT!T Cutting Mist on the donor plant prior to harvesting the cutting helps keep sugar production in the leaf at normal levels following harvesting. Keeping these levels closer to normal will help reduce stress and the inappropriate production of ABA and ethylene. Continuing with the Mist for 2-3 days ensures that this remains the case. ROOT!T Rooting Gel forms a barrier around the cutting stem that helps to hold it in a low stress state, allowing the natural processes of plant repair. For best results, ROOT!T Cutting Mist, First Feed, Rooting Gel and Natural Rooting Sponges should be used together for the cutting process. The nutrients and micro nutrients in ROOT!T Gel and ROOT!T Cutting Mist are balanced to work at a molecular level with the natural physiology of the plant to encourage root bud formation in cuttings. Use together to get the best results!